The pygmy hippopotamus (Choeropsis liberiensis) is a herbivorous creature that exists predominantly in western Africa's Liberia, although to a much lesser degree in nearby nations such as Nigeria, Ivory Coast, Guinea and Sierra Leone. The moderate-sized animals are considered to be significantly more timid than their larger counterparts, the common hippopotamus. The pygmy hippopotamus usually lives in swamp and river settings that are in the midst of thick and damp tropical lowland forests. These nocturnal hippos often like to stay in burrows closely surrounding rivers. Since they are semi-aquatic, it's important for them to never be far from water. H20 is vital for these hippos as it both cools their bodies and hydrates their skin. These hippopotamuses are vegetarians, exclusively consuming plants -- think foliage, ferns, grass, forest herbs, roots, fallen fruits and shrubs. They also feast occasionally on semi-aquatic plants. 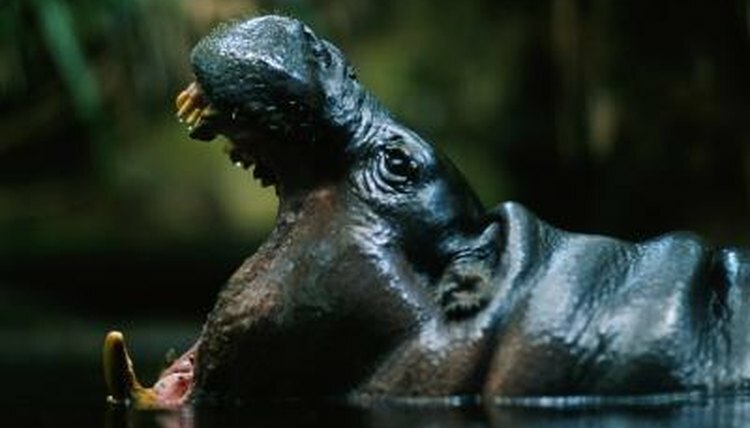 Unlike most other animals, pygmy hippopotamuses use their lips instead of their teeth for chomping purposes. As a result of habitat loss, the pygmy hippopotamus population is dropping and the species is considered to be endangered by the IUCN Red List of Threatened Species as of 2008. Some of the causes for the habitat loss and ruination are pollution in their water environments, poaching, logging and human development within the forests that serve as their homes. Hunting is also associated with the drop in population. According to Bristol Zoo, there may be fewer than 2,000 free-roaming pygmy hippopotamuses remaining. However, captive reproduction efforts are in full swing, including one in the United Kingdom. In terms of size, these solitary animals usually range between 352 and 595 pounds when full grown, according to the Edge of Existence. Body length is typically somewhere between 4.9 and 5.7 feet, and height is in the realm of 30 and 39 inches. Pygmy hippos possess wide snouts, stubby legs and skin that is usually gray, blackish-green or pale gray. Pygmy hippos are different than common hippos in more ways than just their much smaller physiques. The birthing practices are also very different between the two creatures. While common hippos welcome their young to the world in the winter, pygmy hippos do so on land. The youngsters are capable of swimming immediately after birth.